No, the system of Donjitsu Do is not a form of religion. However, for some it is very much a spiritual endeavor. Any complete system of martial art must have a way for one to look at one’s self more closely and explore who we really are and identify our strengths and weaknesses. This allows us to strengthen our own beliefs. It is also important for one to understand that to follow a traditional martial way requires an attitude of open-mindedness. Our dojo is a place where people of all walks of life and religious beliefs are welcome and respected, not judged. One of the most important lessons taught in our dojo is respect. Respect for ourselves, nature, and others. It is a place for like minded soles to gather and explore the answer within themselves through the study of Budo. Our dojo is a not the place to judge or be judged, but a place of self-enlightenment and to study self-defense. Many who enter our dojo are confused while others are actually afraid by the act of bowing during each class. It is merely a show of respect and not to be confused with a sign of submission or worship. The study of Budo is actually a way of strengthening your beliefs; not converting to another. It is important to understand that if your religious beliefs are strong and true then you cannot be converted just because you train with someone who may have different religious beliefs than you. Religion has nothing to do with what is taught in our dojo. However, for those of you who harbor these fears or misunderstandings I will explain the purpose of the bow in Donjitsu Do. Keep in mind I can only speak for Donjitsu Do even though this will apply to many other martial systems as well. 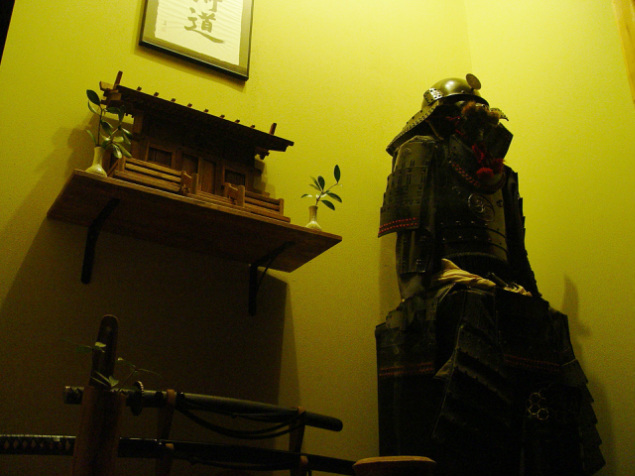 Located in the very front of our dojo is an alcove called a “kamiza”. This is the Japanese term referring to the “top seat” within a room. In Japan today it also applies to the best seat in a car, train, or plane. It is considered a place of honor usually located furthest from the door. Historically it would have been the warmest as well as the most defensible to the person sitting there with their back against the wall. In a western home, it would be comparable to the head of the table or the chair where the head of the family might often sit. Within the kamiza you will often find precious art and artifacts that hold memories and tells a story of history and cultural beliefs that stretch into the past. This is very much like that of the mantel in Western and European homes which hold the same pictures, memorable objects, and things of special importance to the family or group. In many traditionally styled dojos you will find what is called a kamidana (“spirit house”). Inside the kamiza, or up high on a shelf at the head of the training hall, you will find this kamidana which will be surrounded by objects and/or symbols pertinent to this particular system or tradition. For many this is the object of most concern as they feel that when they bow facing it they are bowing to some type of Deity or God other than their own. In our dojo the kamidana is located in the kamiza and is considered the “heart” of the dojo. This is the focal point of the dojo and where the respect of our bows are directed. In Japan the kamidana can be found in almost every house and dojo. It is associated with the Shinto belief. I do not practice Shintoism; however, the absence of Shinto beliefs does not necessarily require the exclusion of the kamidana. Even though a delicate matter, it serves as a reminder of tradition, the deep meaning of budo in my heart, and my search of Do (“the way”) carrying it forward. It is surrounded by objects with pertinent symbolic meaning to this particular system of Budo. At the beginning and end of each class we sit quietly on our knees in seiza (Japanese formal seated posture) facing the kamiza. We take a moment and allow ourselves to settle, clear our minds, and shed the worries of the day so we can focus on what we all have gathered to do. “Dojo ni rai” (bow to the dojo) is then said. This is done to show respect to the place that we have come to learn more about ourselves as well as thanks for having such a place. It is also showing respect and gratitude to the legacy of the martial art of which we study and all those who came before us, paving the way with blood, sweat, and tears, so we may be able to protect ourselves and become more enlightened individuals. Next we recite the words “Shiken Haramitsu Daikomyo” and then we clap twice, bow, clap once more, and then a final bow. Although the depth of meaning for this can be quite deep the basic idea is a search for enlightenment: “Allow my next act to bring enlightenment, help me to understand why I am here and what it is I came to do”. Within each moment of life there is the potential for enlightenment. Each experience can lead us to a better understanding of whatever it is we seek. The first two claps are to center and focus one’s self and the last is to signify that I am ready to begin this new journey of enlightenment. At that point, the instructor will turn and face the students as the highest rank says “Sensei Ni rai” (bow to the teacher). Both student and teacher bow to each other as this is done by the student as a sign of respect for the positions held, years of training, guidance in their study of the art, and a sign of respect and acknowledgment by the teacher to the student. The teacher will then say to the students “Onegai shimasu” (literally translated as “please”). However, in the context of the training in the dojo, the teacher is asking the student for assistance with their training: please study diligently, please do what is expected of you, and please receive my instruction. As the student repeats it back to the teacher it is spoken as: please give me your instruction; please help me learn what you know; as well as, please teach me correctly - a great responsibility I fear many instructors do not realize. The teacher and student both bow once more in acknowledgment of the request made by each. At the end of each class this entire ritual is performed once again just before we each go back to our everyday lives. Our search for enlightenment never ends it is with us every moment of every day. After each class all of the students must ponder and practice for some time before the true essence of the technique or lesson becomes apparent. Many times I have been told by a student that a lesson from several days, weeks, or even years earlier, just recently became apparent to them. Keep in mind that when we use the word enlightenment it is not always in the context of understanding the complexity to life or obtaining a higher existence. Enlightenment occurs anytime we learn something new. It is any knowledge learned or acquired through instruction; any new bit of information that earlier we did not possess. Regardless of the terminology or ritual, the bowing process is all designed to slow each of us down, allowing one to find center before beginning their training. Most importantly, the bowing teaches respect, tolerance, and focus – it is not a religion. Respect is something we all desire and deserve. Yet, for something so important to all of us, respect for another’s views, color, culture, and religion is something many are lacking in today’s world. Many people demand respect and no matter where they find themselves in the world they offer very little back in return. This I find sad. However, I do not just wish it was different. I try to do something about it and combat this issue every time I open the doors of the dojo. I treat everyone I meet with respect and teach my students not only with my words, but my actions and I strive to make a difference. In November 2009, President Obama visited Japan and bowed to the Emperor. This is the customary greeting in Japan just as the hand shake is in America. However, it was criticized by many and viewed as “treasonous” or as a sign of weakness. The media reported critics saying that “Americans bow down to no one”. Personally, I was quite embarrassed by some these responses. His attempt at bowing was no more than a sign of cultural respect, not submission. In Donjitsu Do, I teach that the only way to gain the respect of another is to show them the same. It is my belief that the study of Budo is the same. In order to realize all that it has to offer you must experience and respect its traditions and culture. Your spirituality and religious beliefs are only be decided by you.